Purpose: The Pre-Academy program was developed in response to US Soccer's initiative to develop more players, beginning at younger ages. Due to Empire's geographic location we only have DA Boys teams at u15, u17, and u19 age groups (similar to other DA clubs from remote locations of the US, including MLS clubs such as Toronto FC, Montreal Impact and Sporting KC). As a member of the US Soccer Development Academy, Empire United is taking initiative to develop those players who have the ambition and aspirations to become a world class player, and to contribute to Youth National Teams and competitive college soccer programs during their career...at an age before they can play for the u15 DA team at Empire United. Empire’s Pre-Development Academy training is a supplemental program for players who desire regular elite level training and competition at an early age. All PDA sessions are organized by Rory Charcholla (Boys u19 Head coach and Boys DA Director) and Paul Valenti (Boys u17 Head coach and Boys DA Associate Director). All training sessions are run and implemented by DA/PDA Staff members...the sessions themselves being led by DA staff members Michael Tanke and Andrew Lill. Like with our full-time Developmental Academy teams, Empire’s aim is to provide the highest standard of training in WNY (this is why the same coaches who work with the full-time teams will be running the PDA). By focusing on technique as well as organized attack, defense, and transition moments, our coaching philosophy is to develop the individual player as well as introduce the group to our club’s Style of Play and Identity exercises. This approach to the PDA sets a clear pathway for these young players who wish to graduate to the Boys DA Full-Time teams of the future. The PDA is a 7 week program (each 7 week period is called a "Phases") consisting of 1 training session per week. Empire will run three phases from August to March, with a separate Summer Phase taking place in July. Sessions are broken up into two zones based by birth year. Training sessions will take place on weekends (Sundays whenever possible) at the Empire United Soccer Complex in Rochester (1520 John Street, West Henrietta, NY). As a reminder this is an invite only program available only to players from Empire United (Canada, Buffalo, Rochester) and their affilitates (Syracuse affiliate - SDA, Utica affiliate - SDA Utica). Can players still play school/other sports if chosen for the Pre-Academy Program? Yes! These training sessions are 1x per week, mostly on Sundays. Most Modified school sports do not have a heavy commitment on weekends which will allow for them to be a part of the PDA while participating in school sports. How are the players chosen for the Pre-Academy Program? Players are constantly evaluated by Empire United Club coaches in their every-day team environment. Coaches and DOCs of Empire clubs and affiliates recommend players to the DA Directors. The PDA Staff itself watches players in their normal training environment, in leagues and tournaments, as well as in current phases of the PDA. Prior to each phase the DA Directors invite the top performing 15-20 players from each birth year to attend that phase of the PDA. Between phases new players are invited based on performance and work ethic in their club environment. Why is there no programing from March through August? From March to August youth players of the ages we train for the PDA are overloaded with matches and training as the weather turns nice. Beacause of the increased demand physically and mentally the PDA takes a break during this time period, helping to avoid burnout and injuries from fatigue. To maintain contact with players during the Spring period the Boys Development Academy runs Empire Training Centers to maintain contact with the players during this busy schedule, while also not overloading players. In July of 2019 the Boys DA will run the first ever "Summer Phase" of the PDA. The Summer Phase will consist of one session per week during the month of July. The Summer Phase will be part of the curriculum for the 2019-2020 season, with invites going out prior, during, and after Empire United Club Team tryouts. Do the players play any matches or in any events? PDA u13 & u14 Teams after final training session prior to departing to NC for the US Soccer DA Regional Showcase. Every match at the Regional showcase is scouted by US Soccer YNT scouts as well as attended by scouts from professional clubs from US and abroad. 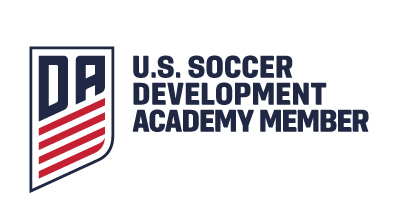 Two members from the u14 team have been selected to attend US Soccer YNT Training Centers since the DA Showcase. One of these players has signed to play for MLS club Sporting KC for the 2019-2020 season.